A notebook for fiction writers and aspiring novelists. One editor’s perspective. Why do we write? Or, more specifically, for what purpose do we write? (Okay, and let’s forget about that Pulitzer for a moment.) But what is it that we hope to convey to our readers? What do we assume will move or excite or enrich an audience? Characters or insights that might remain in their thoughts for a month or a year or a lifetime? The simple answer is, of course, we want to tell a good story. But let’s dig more deeply. What exactly defines a Great American Novel? (Or a Great Nigerian Novel, for that matter.) As fiction writers, are we attempting to reveal the truth about…what? The truth about truth? About deceit? About pride or prejudice, war or peace? About fate or luck? About zombies or ghosts, aliens or evil step-mothers? About falling in love or coping with death? About fitting in or dropping out? In a real sense, whatever our genre, or topic, whatever our slam-dunk story line, there’s a deeper importance—one that infiltrates all plots and genres and fictive rationale. One that connects author and reader. Because, for me, the key isn’t about writing “What Happens.” It’s about “What Happens to People.” No matter our story, whatever our genre, whatever our goal, we’re ultimately writing about characters who are important to us. Who feel real to us. But when a writer truly cares about his characters (the good, the bad and the ugly), readers have no choice but to also care deeply for them. And one of the most cogent ways to reveal a character? Through dialog. Through internal monologue. A paragraph or two of primo dialog can be worth a chapter or two of banal omniscient narration. …..“Maybe just a slight headache, once or twice,” he said with a smile. …..“Too many expectations,” he amended. “Of becoming something you’re not. The spontaneity dies and suddenly being yourself isn’t good enough any more. You feel yourself being molded—crammed into an uncomfortable box. Somewhere you know you don’t belong. Do you know what I mean?” he asked. Allow yourself to truly feel your actors. Remember, in life, there are no 100% heroes and no 100% villains. Even Adolf Hitler painted pretty pictures. Even Gandhi threw tantrums. So permit your characters to fully inhabit themselves—allow them to speak freely about who they are and what they want, both to you and to your readers. And when you feel moved by what you’ve written, that’s when you know you have a the workings of a great novel. Rule #41. Great fiction isn’t about plotting. It’s about people. The above rule isn’t meant to dissuade anyone from concocting an amazing, consistently dramatic, plot-twisty magnum opus. If you’ve discovered the mother-lode of great plots, and believe you have a logical and rational reason to frontload that information, go for it! However, one word of advice. While you’re plotting your epic masterpiece, don’t allow your characters so sit there like lumps, watching reruns and eating bonbons until the plot comes knocking at their door. Give them substance and give them purpose that excites the reader…even before the plot reveals itself. Once we’ve established our characters—either partially or fully—once we’ve given them flesh and bone, hopes and dreams, courage and fear, imperfections and eccentricities, now we can let loose the proverbial Hounds Of Hell. Or think of Rule #41 this way. Put an eclectic cast of chatty characters on a luxury liner slowly sinking in the icy Atlantic and you’ve likely got a page turner. Put that same boat in the same predicament—but with nobody aboard—and what do you have? A scholastic essay on buoyancy, I suspect. One issue I’ve encountered when reading manuscripts concerns character classism: characters—especially protagonists—who are destined to live through the novel (and typically loved by the author) are largely well conceived and fully formed, full of life and joy, witty and urbane—sometimes real as real can be. And then there are the story’s second class citizens, background characters who sometimes seem to be barely breathing, roughly sketched, often dull and lifeless. These are minor characters that I realize (as a reader) are going to die, or else drift off the page sooner or later. Even if these characters have only a modicum of stage time, they need authorial love too. They need your full attention and development. If these characters aren’t fully honed, when they leave the story, or die, readers won’t really care. But a reader should care. If a reader isn’t made to care about a character—either one we’re supposed to love or we’re supposed to hate—there’s probably no reason for that character brought to life in the first place. So, back to the basics. Let’s return for a moment (see Dialog, Part 2) to our aforementioned sci-fi thriller, The Great Big Giant Meteor. Remember our beleaguered hero, Charlie? Let’s say, early still in Act I, Charlie and his former girlfriend, Andrea, are walking on a moonless night, staring up at the heavens. Maybe that long extinguished spark between them has ignited again. The meteor is still a distant, undiscovered speck in the sky. Q. How do we fill all those pages before the meteor’s presence is known? A. With astute, meaningful character development. …..“I’m so sorry,” Charlie said, his voice shaking. Such personal revelation not only contributes to the reader’s comprehension of our characters, but (in this case) keeps the reader subliminally aware of what’s out there—the meteor, of course—the universe being an infinite, largely unknown and often lethal place. It’s wise to seldom allow our readers to drift too far from the undulating drama that, sooner or later, will show itself. Or think of character-building this way: Create characters interesting enough—in this case Charlie and Andrea—that even if an impending world-ending meteor doesn’t exist in your story line, your characters are complete and stimulating enough to keep the reader riveted. Keep us glued, even if your book is simple story between two space nerds looking for love. That’s what great dialog can provide. As previously suggested, great dialog should accomplish one of three specific goals. Whenever characters speak, we use dialog specifically to: 1) Set a scene; 2) Develop or define a character or characters, or; 3) Forward the plot. Every writer must walk a fine line between the typically inarticulate, incomplete and often rambling real-world verbal diarrhea—sorry! But true!—that our brains somehow manage to interpret, and the vapid, usually boring, just-the-facts-ma’am sort of written dialog that some of us employ, intent on steadfastly moving the plot forward, and largely at the expense of a fully developed character. Somewhere in the middle is the sweetspot—that perfect blend of casually informal, yet subtly informative, dialog that readers will consume like buttered popcorn at a Hollywood Premiere. …..“Yes, at the observatory. Both of us going for our Ph.D’s at the time. We were—for a while we were close,” Charlie said, staring past Doug’s shoulder for a long moment, reliving some silent memory. All of which means….what to a reader? A half-page of unnecessary banter that goes nowhere? Or something else? Might Andrea’s arrival hint of a potential love interest for Charlie—or something else? And what about the Dr. Smith/Dr. Jones confusion? A simple lapse in memory—or something else? Is there really an alien spaceship buried in Siberia—or something else? And that casually mentioned hot-spot? Most readers will interpret that particular significance easily enough. But what other subtle goodies lurk within these few paragraphs of chitchat? Yes, we’re teasing the reader, but a competent writer is continually looking for areas or elements from which to evolve or twist a story, to constantly keep readers on their toes. What else might these few paragraphs reveal? Maybe Charlie’s good friend, Doug, soon falls in love with Andrea. Or perhaps Charlie comes to believe that she’s secretly working for the Russians (for some as-of-yet unknown, nefarious purpose). Maybe readers won’t be conscious of these potential sub-plots—but the seeds have been subliminally sewn. A reader will patiently wait to see which ones sprout. As the writer, you already know what the reader does not—that the approaching meteor is actually a billion-ton, Denver-sized space diamond in the rough. Andrea’s insanely wealthy corporate bosses have also discovered that fact and have decided to capture the meteor, ease it in a stable orbit around Earth and mine it—and what could possibly go wrong with that scenario? So despite Charlie’s best attempts to destroy or divert the rock, his efforts are continually thwarted by unknown agents. Why? Because we’re stacking additional dramatic obstacles at every turn. And dialog is going to be instrumental in creating or continuing that drama—a direct (yet typically subtle) information-highway between Charlie and Andrea, between Charlie and Doug and (possibly) between Andrea and the mysterious Dr. Jones. When poor Doug ends up suddenly dead late in Act II, who’s to blame? And why? Questions anew that a competent writer will answer at the appropriate time. And when Andrea’s brother Sergei shows up on page 178… hmm, possibly more complications. Ah yes, timing! Great dialog isn’t only about concocting dramatic, informative, and oh-so-witty conversation—but also conversation that appears at just the right moment and in a logical sequence with past and future chatter. When you ask a question in dialog (“Who would have killed Doug! He didn’t have an enemy in the world!”) allow your reader sufficient time to ponder the answer. You’re not obliged to immediately solve the mystery. Sure, you know—but it’s okay to string along the reader, waiting for the appropriate (and perhaps exquisitely unexpected) moment for the necessary reveal. My advice is to never (or rarely) reveal too much too fast. In fact, that should probably be a rule. Rule #39: Never reveal too much relevant information too quickly. Whether you’re writing drama or comedy, a thriller or love story, sci-fi, horror or fantasy, continued suspense of one sort or another is imperative. Within each conversation, it’s okay to create a little more confusion or distraction or confrontation. With each provided answer, feel free to ask another question, or two or three. And then, late in Act III (typically your final act) begin to collect whatever loose threads that remain and resolve any unanswered questions. * I once had a savvy journalism prof who gave an unusual class assignment: Secretly record a 1 minute snippet of conversation, then write it down verbatim. So I recorded 4 friends chatting in a pub. (And these were sober people, mind you.) When I transcribed the conversation, it made absolutely no sense on the page. Complete, utter gibberish! Sentence fragments. Lost or shuffled thoughts. Topics that changed mid-stream. Everybody simultaneously talking…and who’s listening anyway? So, no, real life chatter seldom works on the page. ** Squirrel! Squirrel! Dog owners will understand. *** As always, no writing rule or suggestion of mine should be considered iron clad. (Hell, I don’t even listen to myself all that often.) So if your story demands an immediate burst of plot-essential material, by all means follow your instincts. Crayon outside the lines if it feels right. All I ask is that you understand the fundamentals before attempting to break them. Why, you ask? Did you ever put a raw egg (shell intact) in the microwave and turn it on HIGH for 2 minutes, unaware of the fundamentals regarding eggs and microwaves? Try it and get back to me. Writing a novel without knowing the rules—well, the outcome is kinda like that. Let’s assume that we, as aspiring novelists, have sufficient technical, stylistic and plot-building skills. Meaning we can turn a phrase, can fully frame a story, we trust our characters’ various motivations, can discern a verb from a noun, and rarely allow ourselves to dangle a participle. All those crucial factors being securely in place, what then becomes the single, most essential element necessary for writing—not to mention publishing—a truly great novel? Sorry, but that was rhetorical. Because the answer is dialog. For my money, few aspects of novel writing can captivate, motivate or emotionally move a reader as will dialog. Great dialog is, IMHO, more important than solid plot structure. More important than a mellifluous voice. Time and time again, as an editor, when I confront slow or unwieldy dialog I feel my interest in a manuscript begin to deflate like a puffer fish on a salad fork. But enough preamble. Let’s talk about dialog. While omniscient narration* can lay out much or most of a novel, a writer really can’t really tell a whole story without dialog. Can’t fully involve the reader. Can’t fully reveal a character. As importantly, great dialog can be a panacea of sorts—a way for the author to instantly develop a rapport between characters (or between a character and the reader), to fill a vacuum or quickly shift gears, to intentionally misdirect or to clarify and, basically, to solve a myriad of plot-thwarting issues—and in ways that a novel without dialog (or with insufficient or anemic dialog) could ever hope to resolve. Think of dialog as being that essential roll of duct tape in our bag of literary tricks. But more about using dialog as a problem-solver in a subsequent post. Frankly, it’s the sheer joy of creating dialog that inspires many of us to fill our stories with the witty, astute, finely-honed verbiage uttered by our characters. Problem-solving is merely an added bonus. So let’s start with the basics. If having only three options seems restrictive, fear not. Your expressive, expansive wildcard exists in #2: character development. A great deal of seemingly superficial or extraneous dialog can go a long way to help define a character’s personality, motivations, fears and passions, to ultimately create a very real human being. Two characters, hitchhiking through the middle of nowhere, can fill an otherwise mundane scene with the most tantalizing of conversations—about their fears, their desires, their darkest secrets. Maybe such character chatter reveals little about the plot ahead, but those pages can provide a great deal of insight about the people inside your head, not only relating to each other, but to readers as well. Before I continue—one important note. When I speak of dialog, I’m referring to both external and internal communication—because both spoken words and internal contemplation share equal importance in a novel. ….“Do not attempt to humor me, Mr. Jones,” Veronica said crossly. “You’re presumptuous to believe that I’ll ever allow you to marry my daughter or inherit my wealth. I’m well aware of of your scheming ways, sir. Good day.” She turned and continued her stroll down Elm Street. ….Veronica offered the man a tepid smile, well aware of Mr. Jones’ intentions. He’ll never sway me with his fancy talk, she mused, her gaze unwavering. Her emerald eyes blazed, the voice inside her head oozing with contempt. You don’t want to toy with me, young man. I’m well aware of your scheming ways. I shall never allow you near my daughter or her wealth. Without a word, Veronica turned and continued her stroll down Elm Street. But more about the complexities of internal/external differences later as well. However, before moving along to Dialog (Part 2) one reminder (because now it’s Rule #30): Create dialog that (like plotting) accomplishes one of three specific goals: 1) Sets a scene; 2) Develops a character, or; 3) Moves the plot forward. * Omniscient Narration (a reminder). Typically when writing in third-person (past or present) omniscient narration provides a pansophic (all-knowing!) perspective that offers information to the reader unbeknownst to your characters. For instance, the following sentence is omniscient narration: Deep in a forgotten cave burrowed beneath Old Hickory Mountain, a storage chest had been buried centuries ago, hiding the bandit Juan LaFortuna’s missing treasure—an immense fortune that would prove fatal for most of those on Sal’s expedition. Information is the enemy of Action. Action is the enemy of Information. Meaning that, as a writer, it’s my obligation to choose one or the other concept (action-based or informational) to define each scene I develop. I can either depict (spectacular) action or provide (revealing) information to a reader. But I cannot simultaneously provide both, as the two concepts are inherently incompatible. Action sequences typically rely on external cues; on visual, sensory-heightened but otherwise superficially detailed observations. Conversely, information dissemination tends to internalize, and either through omniscient narration or dialog provides pertinent revelation, newfound knowledge or secrets unbeknownst to other characters or to the reader. For example, let’s say I’m writing a fictional account of the Crimean War (1853-1856). Midway through my tale, I describe a gallant yet foolhardy British cavalry charge into Tennyson’s infamous Valley of Death. * Hidden amid the rocky hills surrounding the valley, dozens of fortified Russian cannon open fire and obliterate most of the advancing horsemen. As the smoke clears, two survivors of the bombardment—brothers, by the way, Niles and Ian—stand bloodied and haunted among their dead comrades. The men talk in a hushed whisper, speaking through tears about the heroism of their fallen comrades, about the enemy they see gathering on the precipice ahead, about the unlikelihood of ever again seeing the lovely Lady Desiree, the woman back home they both love. The cavalry charge? That’s action. I want my audience breathless—so it’s all thundering hooves and glistening sabers and a distant blare of bugles whipped away by the wind. Explosions and carnage. Glimpses of both unfettered bravery and agonizing death. Action. But then—cut to a new scene—the big guns have fallen silent. The two brothers crawl toward each other, dazed and isolated on the body-strewn battlefield. Ian begins to bind Niles’ wounds. They speak intimately about life and death and love and—for the reader—that’s information. Character-building usually is. The brothers ponder the probability of their impending doom, not to mention Ian’s long-overdue revelation of his love for Desiree. Acrid smoke drifts across the now silent valley. Niles suddenly draws his pistol and aims at his brother—but then shoots a Cossack who’s crept up behind Ian, ready to pounce with a gleaming scimitar. Ian turns, stares for a moment and returns to his comments, his thoughts once again focused on Desiree. As their horses rush the two men toward certain death, their sun-drenched sabers held high, Ian turns to Niles and admits that he’s in love with his brother’s fiancée, then demands a frank and earnest conversation about the matter. …..“Now?” Niles shouted incredulously over the roaring wind. Um… no. Because whatever raw emotion I’ve thus far developed is now moot, the drama unnecessarily deflated. Sure, Ian may love Desiree, and she may be weighing heavily on his mind—but now isn’t the time or the place to bring that particular plot thread to the page. But what if Desiree is important to the story? What if my entire novel is based on a decades-long love triangle. So where does Lady Desiree belong? Some writers may believe that she belongs exactly when and where she pops into mind—but consider how her sudden appearance will effect the overall pacing and the reader’s emotional quotient. As previously stated, her character certainly doesn’t belong here, in the middle of a raging battle. Amid the carnage, poor Desiree’s attempt for a modicum of stage presence feels extraordinarily misplaced. The importance of her presence, or her words, may easily become lost as readers gloss over this unexpected, lilac-scented intrusion, eager to learn how the attack concludes. The simple solution? Alternate action and information scenes. (As in often, throughout the entire novel.) Because a more opportune moment for Desiree to bloom would be during a scene or chapter before the cavalry charge, for instance as she tearfully pens letters in her Wembly Park bedroom for both Ian and Niles—letters that may dramatically change the lives of both men. Or else place her in a scene after the charge, perhaps as a flashback in Ian’s memory. Perhaps we see her swoon into the arms of dear Uncle Clive as she’s notified by courier of Ian and Niles’ status as MIA, both men presumed dead. So allow Lady D. and her thoughts sufficient ‘quiet time’ to fully engage the reader. Be aware that the primary advantage of alternating action and information scenes is in potentially increased drama. How delightful, plot-wise, should Ian reveal his affection for his brother’s betrothed in the chapter preceding the cavalry charge! How might Niles’ thoughts be distracted or tormented as he lines up for the assault in the following scene? Now you’ve piqued the reader’s curiosity—and possibly created a perfect cliffhanger that you’ll tie together in an appropriate, upcoming chapter. Might Ian die (your readers will wonder), his love for Desiree forever unrequited? Might brother turn on brother? So, yes, separating action and information scenes has definitive advantages. Intuiting how and when to separate these two crucial elements can nicely turn up the heat in terms of tension and future plot-development. For those uninterested in the Crimean War, let’s say I’m writing a gently comedic romantic coming-of-age tale. Action can be all about the rampant teenage angst and confusion and turmoil leading up to a first kiss. That slow, undulating tension can be as terrifying as the whole British cavalry charging forward toward certain death. Because what’s action if not a sensationalized visualization of dramatic events? Oh yes, so now it’s a rule. Rule #26: Don’t mix Action and Information. Keep these two incompatible concepts separate. So then, what is dialog? …ah, the perfect opportunity for a cliffhanger. *The Charge of the Light Brigade by Alfred, Lord Tennyson. It’s what people read before Twitter. My name is Dave Workman. I’m an acquisitions and content editor for Muse Harbor Publishing. 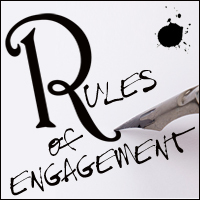 I began writing Rules of Engagement for beginning (or curious) writers, based on what I perceive to be fundamental obstacles that many of us confront when starting, or struggling through, a new novel. Perhaps I can offer useful advice—or maybe not—although I certainly know what excites me as a reader, and what excites me as an editor who accepts or rejects manuscripts. Thus, these following notes may be worth a look. 1. Good Writing, Bad Advice. Rule #1: Finish your book. Rule #2: Don’t listen to anybody if the advice doesn’t resonate. Rule #7: Write in clear, precise sentences. Rule #3. Always write for yourself. 5. Active Writing (Part 1): Active Voice. Rule #20: Don’t extend a scene past the “just enough” point. Rule #12: Write only what matters. Leave out the boring parts. Rule #6: The Jumping Cow Rule (Active vs. Passive Voice). Rule #25: Perfection in writing doesn’t exist. Rule #4: Do the best you can. Rule #10: In fiction, for every action, provide a reaction. Rule #29: Your characters may remain elusive or distracted, but your prose must remain clear and concise. 13. Focus on the Now. Rule #9: A great novel is not so much what you tell, but how you tell it. That’s a writer’s style. 17. Finding Your Voice (Part 2): Do your characters speak to you? Rule #12: Shut up and let your characters tell their own stories. 19. Basic Plotting (Part 1): Right Brain (creative thinking) vs. Left Brain (critical thinking). Unfortunately, we need both halves. 20. Basic Plotting (Part 2): Plot Ahead. 21. Basic Plotting (Part 3): It’s all about the drama, dahlings. Rule #27. Make drama your novel’s constant companion. 22. Action vs. Information: The Oil & Water of Novel Writing. Rule #26: Don’t mix Action and Information scenes. Keep these two incompatible concepts separate. 23. Dialog (Part 1): Writing Great Dialog: An Absolute Necessity. Rule #30: Create dialog that (like plotting) accomplishes one of three specific goals: 1) Sets a scene; 2) Develops a character or; 3) Moves the plot forward. 24. Dialog (Part 2): Writing Great Dialog: Balancing reality and fiction. Rule #39: Never reveal too much relevant information too quickly. Rule #39A: …but relevant or not, always keep dialog witty and interesting. 25. Dialog (Part 3): The key isn’t about ‘what happens.’ It’s about ‘what happens to your characters.’ Rule #41: Great fiction isn’t about plotting. It’s about people.